← Report from the 37th ISA in High River, AB by President Bilton. Jim Allen Speaks: So far the ISA is everything you would expect in a sport that embraces diversity in cultures, playing surfaces, and personalities. Today the arena was open for a practice session and diversity was on full display! The Western Court (blue) plays significantly faster then the Eastern Court (green). The challenge indeed will up to the player to adjust. The one constant is the fun and friendships as players greet each other and expound on the challenges ahead. 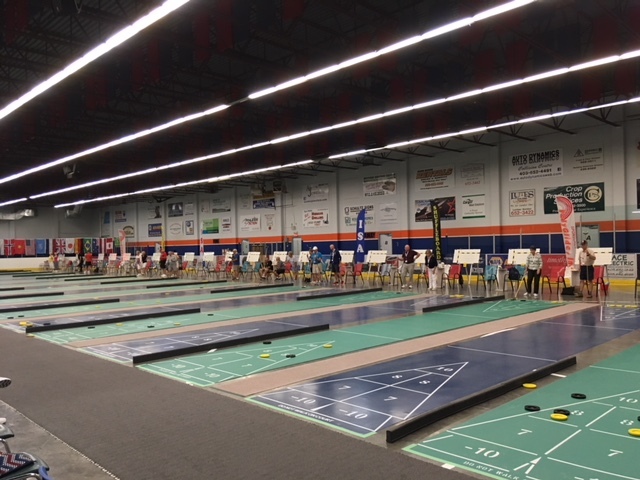 Kudos to the Foothills Shuffleboard Association, and the CNSA as their countless hours of preparation are proving to make this event a success. Jim Allen. 2018 07 15.